The Industrial Brushcutter provides a 72-in. (183 cm) cutting width and has the capability to handle material up to 8 in. (20 cm) in diameter. 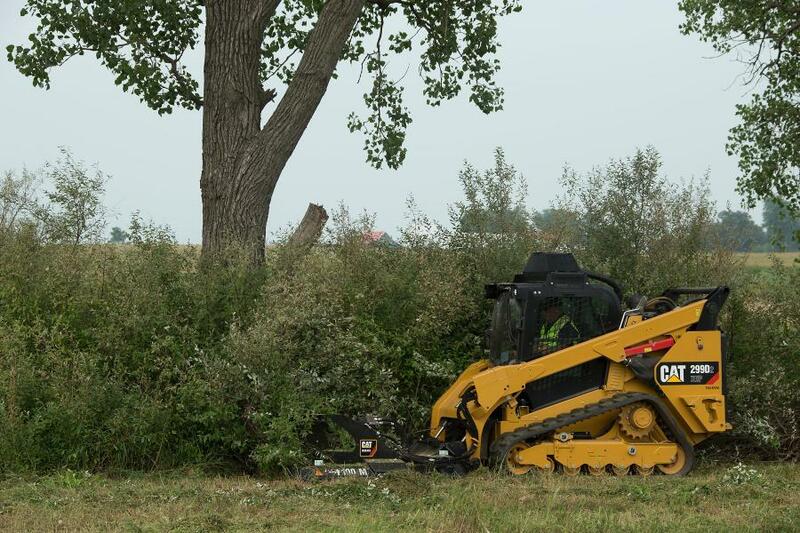 The Cat Industrial Brushcutter expands the current range of Cat brushcutters and is engineered for applications that involve removing or controlling large amounts of brush, small trees and dense vegetation — such as land clearing, right-of way maintenance and site prep. The new attachment is designed for use with skid steer loaders, compact track loaders, Cat multi terrain loaders and compact wheel loaders fitted with a universal coupler. The Industrial Brushcutter provides a 72-in. (183 cm) cutting width and has the capability to handle material up to 8 in. (20 cm) in diameter, ensuring high production with all types of auxiliary configurations, whether standard-flow, XPS high-flow or XHP high-flow. The attachment's high-strength frame and push-bar are designed to direct standing vegetation toward a series of four, hardened, reversible blades that quickly and efficiently reduce material volume. To ensure reliability and to extend service life from the cutter's drive mechanism, the hydraulic motor and gearbox are designed for sustained operation in high ambient temperatures, and an anti-cavitation valve, in conjunction with an accumulator, protects the motor by ensuring consistent fluid flow, even during shutdown. Other key design features of the Industrial Brush Cutter include a heavy-duty, 900-lb. (408 kg) blade carrier that provides high inertia for swinging the blades through dense brush; integrated debris deflector and heavy-duty skids; heavy-duty bearing case for securing the blade carrier to the drive system; and well-protected Cat XT-3 ES auxiliary-hydraulic hoses with a case-drain line for motor protection.